The Wallaroo Equestrian competition and coaching team is committed to breeding sport horses that will inspire the next generation of riders to chase their dream. Breeding horses that like to jump and we love to ride. Wallaroo performance horse stud aims to produce athletic, ridable, sound horses for the competition rider, making it fun to participate in the sport. While primarily using jumping bloodlines, the modern types produced show a high degree of versatility with elastic movement and elegance. Special attention is paid to nutrition and handling, all horses are paddocked in groups and fed according to their developmental requirements. A strict worming regime, regular handling and hoof care ensure the youngstock have the best possible start. The bloodlines are carefully selected to compliment the strengths of the mares. Working closely with other studs in Australia and keeping up to date with overseas breeders, we have ensured our mares carry the blood of the worlds most influential jumping sires including Capitol 1, Cor De la Bryere, Alme, Contender, Corrado 1, Heartbreaker, Caretino, Indoctro, Cassal, Grannus, Landgraf, Jalisco B, Cassini1, Sandro. We have combined these greats with a dash of the best TB jumping lines, whose foundations stem from the ledgends Precipitation, Ladykiller, Sacramento song, Blue Peter and Souvenir. The stud and training stables are located a short distance from the ACT Hall Village at Wallaroo in NSW and overlook the Brindbella ranges. 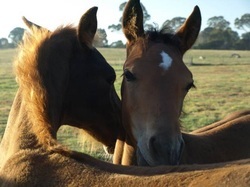 Contact Fiona Gruen 0262302464 fmgruen@tpg.com.aufor an appointment to view the young stock and breeding mares and embryo transfer successes . Proudly sponsoring local, national and international events in the nation's capital. Wallaroo performance horse stud sponsored the young horse classes at the Canberra showjumping classic in Aug 2010 and again the five year old YH class at the 2010 Australian showjumping titles, held at EPIC in Canberra. Wallaroo Equestrian sponsored a class at the Canberra International horse trials in 2009 to 2011.